Oh yes, it is monday again, the weekend was just too short. 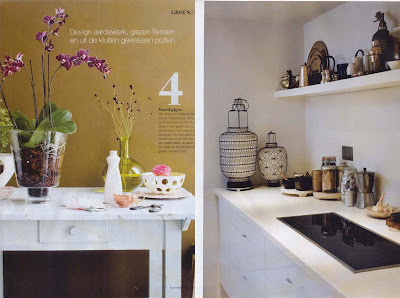 I have some pictures for you from theVt-wonen of oktober and november 2008. I'm in love with white interiors and think we need some more white in our house!!! See bigger and more pictures here. Thank you all so much for your support and comments on last weeks post, this time I used the random number generator for a fair result and he( or is it a she ?) choose number 16 and 18, Merruli and Rubyellen, congratulations, please get in touch with me and send me your details. For those who did not win, I'm sorry but I'm sure I will have an other give-away soon. Yippee, my first ever give-away win! I'll post you my address details later today. 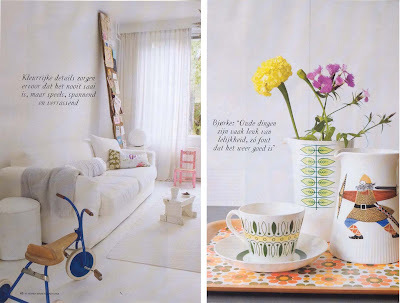 I love the 50's style china in today's post. eek! so excited! i thought i left a comment, but i think i forgot! haha... in my excitement i forget lots of things... is it ever possible to win twice? i love all your magazines!! !